This is a term that gets thrown around a lot in financial blogs, there’s no doubt that on the surface it sounds great and something that we all want to be a part of, but what does it actually mean? 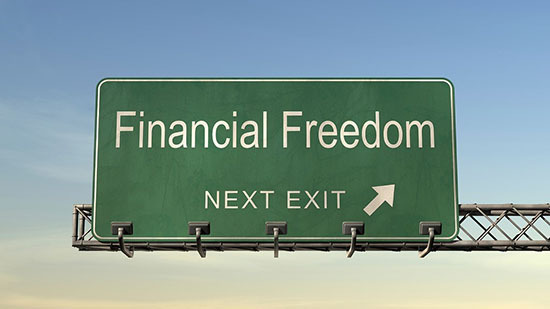 It’s a common misconception that to have financial freedom, you have to be the next Bill Gates. You might be surprised to know that an income of €30,250 is in the top 1% worldwide. Let that sink in for a minute. It’s important to note firstly that you should always take a long term view with your investments, looking at a minimum of 3 years to let your money grow and for the compound interest to start to kick in. Maybe you have your eye on that new Jaguar that’s currently in production and will be released in a few years? Maybe you want to pay a nice chunk off your mortgage before your next big birthday? Or maybe you are planning to pop the question to your significant other? Whatever it is, write down your goal on a piece of paper and keep it in mind to motivate you along the way. For most this sounds like a fairy tale, can you really earn the same amount of money from your investments as you do from your work? The answer is a resounding yes. All it takes is dedication, persistence and a forward looking plan. We will talk more about how this is possible in our upcoming ‘The miracle that is compound interest’ post. You might love your work, and if you do then you probably have no intention of giving it up any time soon despite how much you earn from your investments. But what would be nice is if you could have the option to work or pack it all in if they’ve gone one step too far in the office and removed the coffee machine. Once you set these goals, you absolutely must stick to them because you will no doubt be tempted to change them a few months down the line to make them a bit easier (It’s human nature). So, write them down and do whatever it takes to make sure they are set in stone, stick them on your mirror and tell your close ones about them. Good luck and let us know how you get on with your goal setting at [email protected], we would love to hear from you!